Nowadays, 4K Blu-ray has become more and more popular, people are willing to get 4K Blu-ray disc than 1080p Blu-ray disc (new 4K Blu-ray movies and upcoming 4K Blu-ray movies). Although you can easily play 4K Blu-ray with many 4K Blu-ray player hardware, however, you will be out of luck to watch them with media players on your computer with 4K player software or stream to your large screen 4K TV via media home streaming devices. Fortunately, you can now get full control of 4K Blu-ray movies and make maximum entertainment of 4K Blu-ray movies anywhere at any time as you like with the assistance of 4K Blu-ray Ripper software, which helps to bypass the Blu-ray copy protection and region code, you can then rip the non protected 4K Blu-ray movies into compatible 4K digital file format for conveniently viewing on 4K capable devices and programs. After a lot of online searching and testing, we have picked the following 3 best 4K Blu-ray Ripper software: Brorsoft Blu-ray Ripper / Mac, Brorsoft Ultimate / iMedia, Leawo Blu-ray Ripper. Below is a simple tutorial to rip the 4K Blu-ray movies. First turn to Brorsoft Blu-ray Ripper / Mac, Ultimate / iMedia page to free download the free trail version. Keep in mind that you have download the right version, Windows platform .exe files cannot be installed on Mac OS - and vice versa. Mac version taken as example, the windows version has the same step. Place the disc into the Blu-ray drive, launch the Blu-ray Ripper, and then click “disc” button to import Blu-ray movies into the program. DVD discs, ISO and IFO files are also supported. Tip: If you need to rip Blu-ray (BD+) with wanted subtitles and audio track, you can click the drop down menu after “Subtitles” and “Audio” to select your desired tracks. Click Copy the entire disc button to start to backup Blu-ray disc. In fact, the “Copy the entire disc” feature maintains the entire structure of an original Blu-ray disc, so the m2ts streams are contained. Click Format bar, choose Copy > Directly Copy from the Format menu to copy the .m2ts files only which contains the main movie of Blu-ray disc. After that, do remember clicking Convert button to do Movie-only copy. When the copying work is done, you are able to click Open button to get the output .m2ts without any other extra contents. You can also open BDMV files as well as .m2ts main movies with the free VLC Media Player. The second method is to Rip Blu-ray in digital format with 4K resolution, such as MP4, MOV, MKV, M4V, and more. If you are looking to make digital backups of your favorite Blu-ray movie to MKV files (MKV is a file container format that can hold video, audio, picture, and subtitle tracks in a single file), you can find few better tools than MakeMKV, a freeware video transcoder that is quick and easy to use. You can follow the guide: Rip Blu-ray to MKV with MakeMKV, when the decryption is finished, you have an MKV file that you can play back with VLC or other software. If you want more manageable file sizes, you’ll need to convert the MKV to a smaller file—in the same format, or in a different format, such as an iTunes-compatible MP4—using a tool such as HandBrake. MakeMKV output MKV files ONLY! 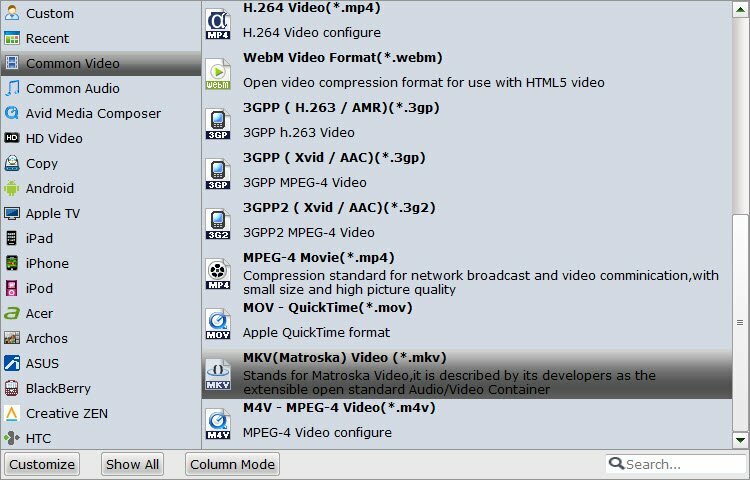 If you wanna convert the MKV rip to more common format MP4, the Handbrake should be the best choice. If you want to rip Blu-ray to all the format (including MKV) DIRECTLY, Brorsoft Blu-ray Ripper is your best choice. After load the Blu-ray disc, Click Format (located below where your Blu-ray's files are displayed) and select the format you want from the drop-down list. Just below Format is Output, here you can Browse your computer for a better destination folder for Blu-ray Ripper to save your converted movies. As you see, all regular video and audio formats like MP4, MOV,MKV, WMV, AVI, FLV, MP3, WMA, WAV, M4A, etc. are provided. If you want to customize output video quality in further, click Settings button to customize video quality like resolution, frame rate, bit rate, audio channel, etc. Warning: In order to keep the 4K resolution, you should keep the size "", or customize the size as 3840 x 2160. After above settings, click the big Convert button to start to convert 4K Blu-ray. As soon as the conversion is done, simply click Completed to back to main interface, and click Open button to find generated videos. If conversion takes long time, you can set auto shut down by checking the box of Shut down computer after conversion.